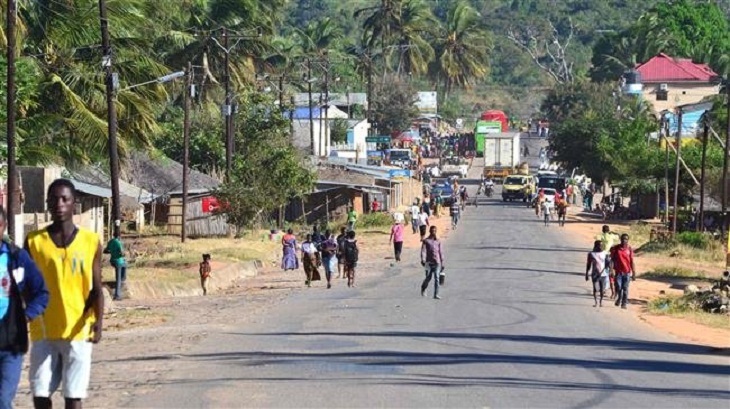 Twelve people have been killed in a suspected Islamist militant attack in northern Mozambique, with thousands of villagers fleeing into neighbouring Tanzania, police sources said Sunday. Hardline Islamists have launched several attacks in the majority -Muslim province during the last year, stoking unrest just as Maputo pushes ahead with oil and gas development in the region. Early Friday, "there was an attack in Nangade district, where there are no security patrols. The attackers killed 12 people, mostly women and children," a police source in Cabo Delgado province, who asked not to be named, told AFP. The attack took place in the village of Chicuaia Velha, just a few kilometres (miles) from Tanzania, forcing several thousand people to seek safety cross the border, police said. A local journalist said the villagers were hacked to death with machetes or died after the attackers torched their homes. "The district of Nangade is far from the sea where the police have focussed their efforts, which allowed the assailants to enter and attack and then retreat," another police source said. "They use guerrilla tactics and attack several points simultaneously. It's hard to control the situation," he said. It was the third such incident in the last month in Cabo Delgado, leaving a total of 20 dead. Analysts say the nascent insurgency staged its first attack in October 2017 year hitting a police station and military outpost in the northern town of Mocimboa da Praia, killing two officers. Originally known as Ahlu Sunnah Wa-Jama -- Arabic for "followers of the prophet" -- the group is commonly referred to by locals and officials as "Al-Shabaab," although it has no known link to the Somali jihadist group of the same name. Its links to other West Africa militant groups such as Boko Haram in northern Nigeria are also unclear. "The current insurrection is a small affair, literally barefoot, with a very strong local dimension," said Eric Morier-Genoud, a specialist in Mozambique at Queen's University Belfast. It is believed to have formed in Cabo Delgado in around 2014 when its leaders called on followers to adhere to a more extreme form of Islam. Experts believe the militants -- most of whom are members of the Kimwani ethnic group -- are also motivated by grievances over perceived discrimination in favour of the Makonde people, the tribe of President Filipe Nyusi. Over the last year, the insurgency has claimed more than 50 lives in gun, grenade and knife assaults. The authorities have already prosecuted more than 200 suspects, including some Tanzanians and Somalis, and shut down several mosques as part of a crackdown. The violence has shaken government plans for Cabo Delgado, a coastal province in the far north that will be a base for development since natural gas reserves were discovered. US oil and gas giant Anadarko earlier this year temporarily evacuated workers from the area and halted operations after the US embassy in Maputo issued an alert warning of imminent attacks. The government has been using the potential energy bonanza from estimated reserves of 180 trillion cubic feet (5.1 trillion cubic metres) of gas off the northeastern shores to predict strong future growth for the former Portuguese colony.